The best resource we’ve found is ATTRA’s Guide to Ruminant Nutrition. What you’ll get out of it: An overview of forage nutrition, nutrient requirements, which species to plant and to avoid, management, and more. Why we love it: This will introduce anyone to the subjects they need to know and consider when discussing ruminant nutrition, and offers additional resources and tools to further knowledge. 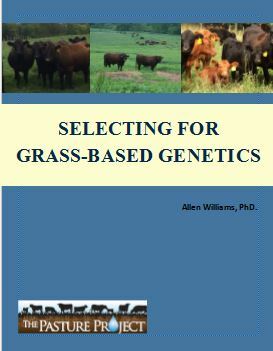 Allen Williams has developed a comprehensive guide to selecting cattle genetics for a grassfed program. What you’ll get out of it: Dr. Williams walks through exactly how to select and develop cattle for a grass-fed program. Why we love it: It’s easy to understand, with very practical insights and lots of pictures to illustrate the points. Dr. Williams is also one of the foremost experts on grass-fed genetics. What you’ll get out of it: A basic overview of several different types of grazing systems, infrastructure to plan for, as well as brief discussions of economics, livestock, and forage. Why we love it: This is an excellent overview, and will introduce a beginner to the world of rotational grazing, and give a reminder of important topics to keep in mind, even to an experienced grazier.